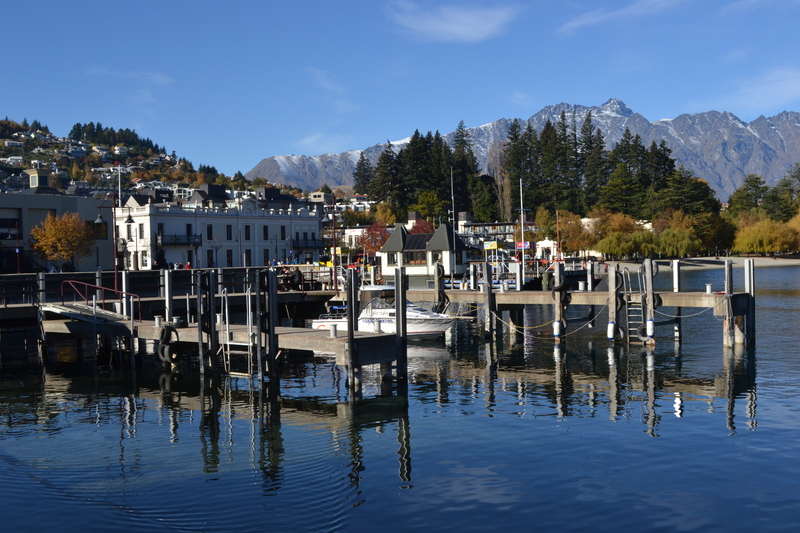 It was off-season in Queenstown. The sun had apparently been packed away for winter. The mountains were hidden under cloudy drapes. The glorious colours I had seen on the postcards had been taken off display. Tarpaulins were roped across the decks of the sailing boats at anchor on the lake. They had not been touched for months. Even the notorious bars were quiet. I had no winter clothes, so wore everything I had at once, and sat with my back to storage heaters while I was in the hostel. The jet boats were still taking groups out, and I heard there was whitewater rafting nearby; but it was unthinkable, at that time of year, to do anything which soaked you through. There was bungee as well, but I am too cowardly for that. I took the cable car up Ben Lomond to ride the Luge instead. The track winds steeply around the mountain and propels you through tunnels and over humps and round banked corners as you barrel along it in a three-wheeled cart. There is a ski lift, then, to take you back to the top so you can do it again and again. There had been a frost in the night and whenever I approached a corner too fast – which I usually did – I went round it sideways and careered into the buffers around the edge, then wobbled back onto the track. The clouds began to peel away as I waited for the cable car down. It exposed the creases and folds of the mountains and the glorious pallet of colours in the landscape: the dark, dark green of the pine forests, the vivid blue of the lake; the burgundy and green of the heathers; the purple-grey Remarkable Mountains with their white heads stuck in the residual clouds; the wine red leaves, the raspberry leaves, the yellows and oranges, and bronzes and tans; the lime green lawns and the yellow wild grasses. A steamship eased itself across the lake, a stroke of white on a canvas of blue, with a curl of black smoke trailing like a streamer from its funnel. 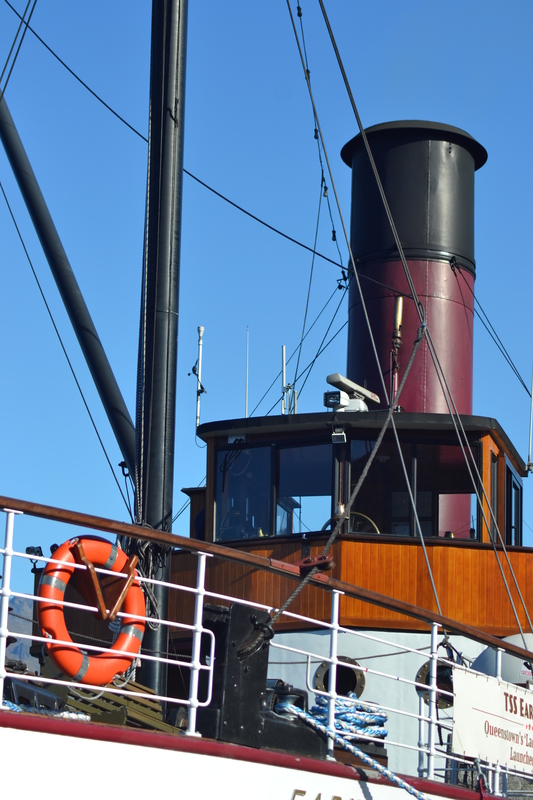 TSS Earnslaw was built in Dunedin in 1912 and has worked Lake Wakatipi ever since. In the early days, it carried sheep to remote farms which had yet to be connected by road. Now it carries tourists. You can go stand in the engine room and get in the crew’s way if you like. (They will just shove past you.) The ship was built a long time before health and safety was invented, and the space is crammed with exposed parts which are hot, or sharp or moving. There are big brass gauges and oversize bolts and levers which need swinging on to move. A stoker humps coal into the belly of the engine, while another walks round with an oilcan and squirts everything which he sees to stop it from seizing up. He turns wheels, opens vents, throws levers, and – after a busy five minutes – the engine begins to chuff and snort and shake. The engineer calls in to look important, wearing white overalls to prove that he that never has to do the grunt work himself. He points and gives orders and then flicks the telegraph to full ahead and the ship powers across the lake at four knots. The sun stayed out but the temperature never crept much above seven degrees. The cold seared into my bones. It is a beautiful place, but I was rather glad when I ran out of time and had to head back up to Auckland. Another interesting insight. I am always amazed on how detailed your descriptions are! I would not remember all the important details, there is no way 🙂 It reminded me a little of us going into locomotive during the train journey in Tunisia 🙂 It was dark and we really did not see much, but were trying to desperately get out of the train before it started its journey again – no success there! Thank you 🙂 I tend to take notes and sometimes the imagery comes to me at the time, other times when I come to write it up. While some of these pieces date back to 2012-2013, they are based on stuff I wrote at the time. I forget the detail too. That’s one of the big reasons for writing as far as I’m concerned. 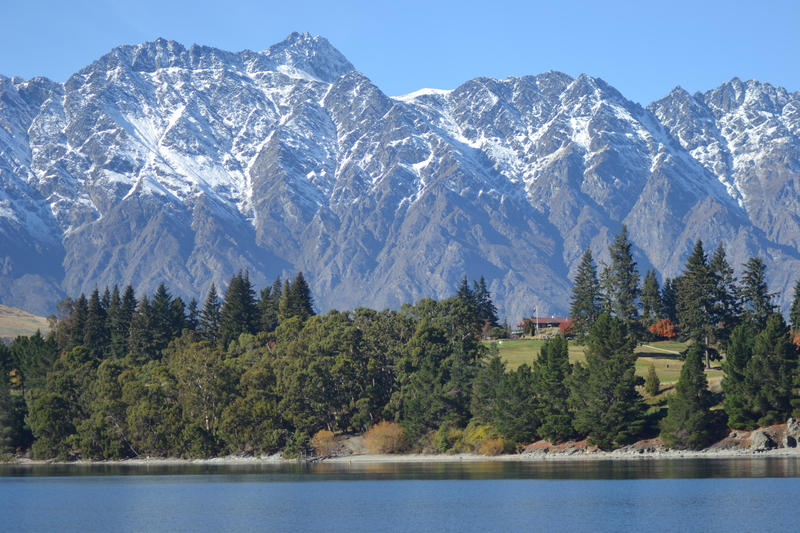 I’ve often wondered what Queenstown would be like in Winter. Thanks for sharing. Reading this, I feel like I’m also there, seeing those things and experiencing the travel. Thanks for the sharing so beautifully.